On April 7 at 4:40 a.m., Syria time, 59 Tomahawk cruise missiles fired from U.S. Navy destroyers slammed into Shayrat Airfield, an important Syrian military base and the source of the nerve gas attack which killed dozens of civilians days before at Khan Sheikhoun, according to U.S. Pres. Donald Trump. The strike is largest U.S. missile bombardment since the 2011 military intervention in Libya—the U.S. Navy fired 47 missiles at ISIS in September 2014—and America’s first major assault on the Syrian military since the Lebanon War. The Arleigh Burke-class destroyers USS Ross and USS Porter in the Eastern Mediterranean fired the missiles at the air base, roughly 16 miles from Homs. The missiles targeted “aircraft, hardened aircraft shelters, petroleum and logistical storage, ammunition supply bunkers, air defense systems, and radars,” a Pentagon statement read. The U.S. military attributed the April 4 chemical weapons attack on civilians at Khan Sheikhoun, which killed dozens of people, to Syrian warplanes based at Shayrat. 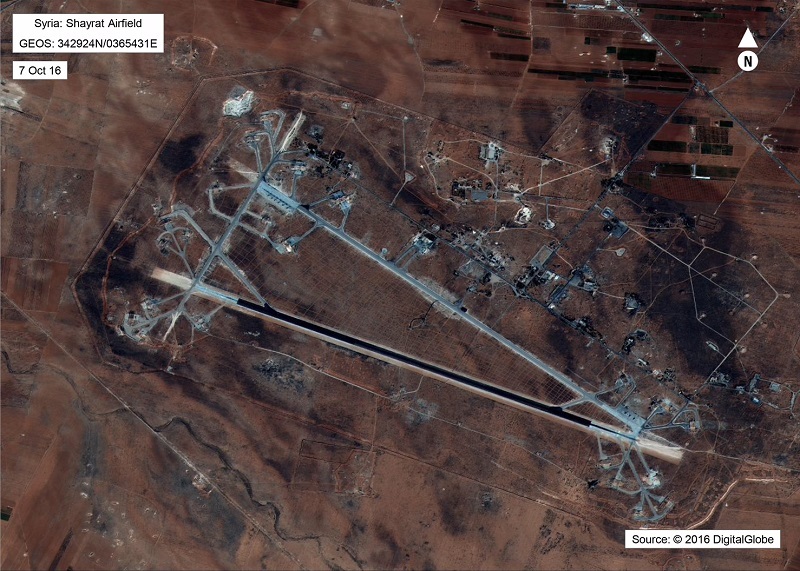 “Initial indications are that this strike has severely damaged or destroyed Syrian aircraft and support infrastructure and equipment at Shayrat Airfield, reducing the Syrian Government’s ability to deliver chemical weapons,” the Pentagon statement continued. U.S. officials noted that Russian military personnel at the base were notified in advance. U.S. Secretary of State Rex Tillerson said Russia “has been complicit, or simply incompetent” in stopping Assad from using chemical weapons. The Russian government urged the U.N. Security Council to meet and characterized the attack as a possible “act of aggression,” and halted the agreement which “deconflicts” U.S. and Russian aircraft in Syrian airspace. Another unknown is whether Russian S-400 and S-300 air-defense missiles based in Syria’s Latakia province attempted to engage the Tomahawks. But it’s important to note that Trump did not send warplanes to bomb the base. Which means that had the Russian and Syrian surface-to-air missiles fired, no American pilots were at risk. Russia’s military presence in Syria is primarily concentrated at Khmeimim Air Base in Latakia. But the disposition of Russians in Syria, although small, is wide-reaching and less obvious than what reporters have often been allowed to see. Russian ground troops and artillery are mixed in with Syrian forces on the ground, and rely on airfields and bases throughout the country to move around and receive supplies. Russian technical advisers have kept Assad’s air force in flying shape. There are some conflicting reports that Russian pilots have flown Syrian aircraft in combat, such as a Syrian Mi-25 shot down by an ISIS anti-aircraft gun in July 2016. Two Russian crew members, including Col. Ryafagat Khabibullin, one of Russia’s most experienced military aviators, died in that clash. It’s still early in the Trump administration, but there are also precedents for the president’s cruise missile blitz—the Clinton-era 1990s. 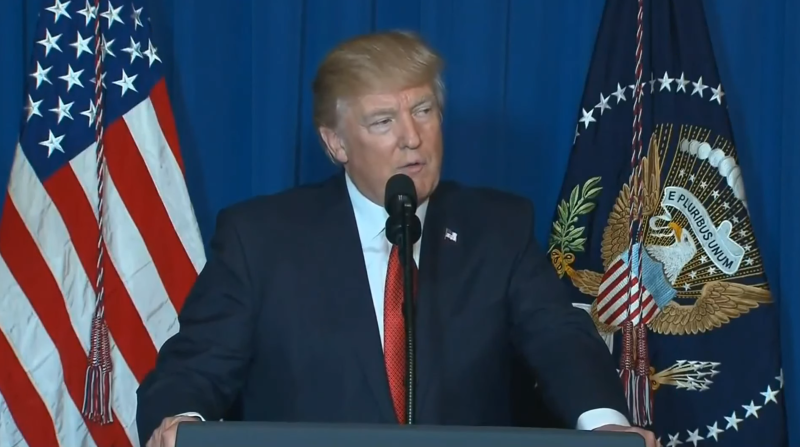 Trump announcing strikes on Syria on April 6, 2016. Back then, the Clinton administration tossed out the prevailing “Powell Doctrine” of large-scale ground forces and overwhelming force, characteristic of the Persian Gulf War, for sudden strikes marked by air power and warship-launched Tomahawk missiles. Historian and author Andrew Bacevich described the then-new Clinton-era doctrine as a means to “expend military power in discrete increments—to punish, to signal resolve, or to influence behavior.” In other words, it was military force as a form of theater and a precursor to the “shock and awe” of the 2003 Iraq War, minus the massive ground invasion. In 1998, Clinton fired 325 Tomahawk missiles—and sent hundreds of warplanes—into Iraq for a 70-hour campaign after Saddam Hussein failed to comply with U.N. weapons inspectors. The Operation Desert Fox bombardment killed hundreds of Iraqi troops and devastated the country’s air-defense systems. But brief, swift bombing and missile attacks had—and have—a way of drawing the United States in deeper. After Desert Fox, the United States and the United Kingdom went on to bomb Iraq off-and-on for two more years. In 1999, NATO war planners began bombing Serbia over its ethnic cleaning campaign in Kosovo with the expectation that a few days of military force would be enough. The war lasted 78 days. Clinton’s other wars and pseudo-conflicts didn’t last so long. Operation Deliberate Force, the 1995 NATO air campaign during the Bosnian War, lasted less than a month. In 1994, 82nd Airborne Division paratroopers were in the air and en route to invade Haiti when dictator Raoul Cédras stepped down. The mere threat was enough to coerce the dictator, but the “invasion” soon morphed into a peacekeeping mission that lasted until 1996. And the word “proportional,” in the Pentagon’s phrasing, is key here. The Russian and Iranian responses are what matters next. Both governments want to keep Syrian dictator Bashar Al Assad in power. Trump—a professional showman—is signaling at least for the moment that he won’t use force to remove him, but he will to stop another chemical attack. It’s an ultimatum Russia and Iran may be willing to accept.